How Long Does a Systematic Review Take? Define your research question. Be as specific as possible, using operational definitions when appropriate. Based on your question, determine whether a systematic review is the best methodology for your review. See Grant's overview of 14 review types and methodologies. Also consider your available time and capacity. Will your team be able to systematically screen thousands of citations? Identify prior systematic reviews related to your topic. A librarian can help with this. Identifying prior systematic reviews can help you define the scope of your research question and determine how your review whether your review will add to the literature or merely replicate past work. Assemble your team. Generally, you will want at least two people to screen citations in order to reduce bias, someone with expertise in data synthesis (qualitative, quantitative, or mixed methods, depending on your plan), and an expert searcher (like a Treadwell librarian). Determine study inclusion and exclusion criteria. Develop a plan of organization for your data. How will you keep track of the citations that you find? What is your plan for bias assessment/quality assesment, data extraction, and data synthesis? Formulate your research protocol. The PRISMA-P standards and checklist can be used to help you structure your protocol. It is recommended that you register your protocol in PROSPERO, an international systematic review protocol registry. The process of registration is straightforward and their guidance notes will tell you exactly what information to include. Conduct a thorough literature search. Create a concept table with keywords. Incorporate database specific controlled vocabulary. Use filters and limits when appropriate. Test the search in one database. Translate the search for your other databases. Export the results into citation management software and deduplicate the results. Use a random sample of your results to test interrater reliability & inclusion/exclusion criteria. Obtain full text and review full text, noting reasons for exclusion. Appraise the quality of the studies. Extract data using a standardized form. Systematic reviews are work and time intensive! Estimates of the average time to conduct a systematic review range from 6-18 months (Source). A study examining the time between when systematic review protocols were registered in PROSPERO and when the systematic reviews were published reported the mean estimated time between registration and publication was 67.3 weeks (Source). Isn't there a faster way? I don't have that much time! To compare and contrast these methodologies, please read Grant and Booth's "A typology of reviews: an analysis of 14 review types and associated methodologies." 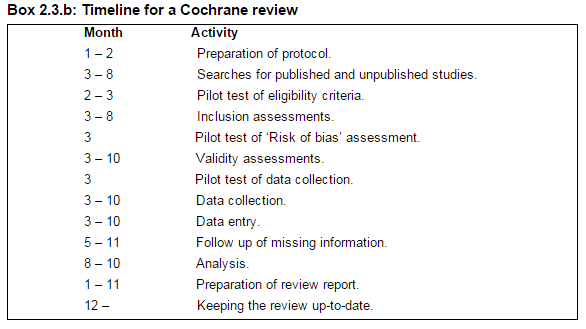 Comparison of rapid review versus systematic review approaches. Table from Khangura S, Konnyu K, Cushman R, Grimshaw J, Moher D. Evidence summaries: the evolution of a rapid review approach. Syst Rev. 2012;1(1):10. doi:10.1186/2046-4053-1-10.